Kiandutu Informal settlement is among the largest informal settlements in Kenya and arguably the largest informal settlement located outside Nairobi City. It lies within Thika municipal and to a regional context within the Nairobi metro region. The settlement is expansive, occupying an estimated 100 acres of land and with a population of about 13, 00 people and 5, 000 households (2009, Kenya Census). This is one of the targets informal settlements in Kenya’s major towns that MuST is prioritizing for upgrading through infrastructure, security of land tenure and housing. This settlement is further clustered into 10 No. clusters (Mtatu 1 & 2, Mukinduri, Biashara, Stage Wariah, Kianjau, Molo, Mosque, Centre Base A & B). These clusters display a unique socio-economic and spatial dynamics but generally there is a high level of heterogeneity throughout the entire settlement. These clusters have emerged gradually through the organic growth of the settlement over time. To strategically drive the settlement towards upgrading, MuST innovative community skills organization came into play and with the aid experienced Muungano members (Federation), they embarked on mobilizing the community on organized daily savings. It’s currently estimated that the federation network in this settlement has close to 700 members and with enumerations and mapping having taken place; this figure is projected to have multiplied considerably. With the formation of the federation, the engagement with Thika Municipal council begun with a focus on working jointly to profile the settlement, as well developing mutual partnership between the community and the authority. Another strategic partner in these engagements is the University of Nairobi, Urban Planning School-Department of Urban and Regional Planning of which MuST partners with in aiding the federation develop their own solutions to their urban challenges. Kiandutu is a settlement lying on Thika Municipal Council land. The municipal is currently developing strategies for regularizing and formalizing informal settlements within its authority. Also the Municipal is currently undertaking a sanitation improvement project in the settlement. The key deliverables of this is project is the construction of various sanitary blocks (pit latrine) and currently an ongoing sewer line construction. However the sanitary blocks are inadequate and the model typology is not sustainable, this is yielding to high demand for sewer infrastructure in the settlement. Water supply in the settlement is as well inadequate and haphazardly reticulated making it highly inconvenient for accessibility. Waste management is almost non-existent with garbage deposits scattered all over the settlement. There is no single paved road within the settlement, which makes mobility and circulation during the rainy season a nightmare. This was a major challenge faced head on, by the technical and community teams that were conducting the profiling exercise as it took place during the December short rain season. With regard to housing, earth walled and timber walled structures dominate the housing typology in the settlement. Nevertheless like many other informal settlements, the housing is in pathetic condition. The settlement lies on a trust land and regularization of the tenure could be a prerequisite for housing improvement in the settlement. It is notable that the settlement has considerably low housing densities, when given some households the luxury of fencing their compounds, a scenario so difficult to sight in Kenya’s informal settlements. The spatial implication being that there is adequate space to accommodate all households in the settlements without displacement in the eventuality of planning and upgrading. With the council having expressed the will to upgrade the settlement, the federation initiated the data collection exercise through enumerations and mapping. This was jointly driven by MuST in collaboration with the Municipal Council of Thika and the University of Nairobi. The federation played a key role in mobilizing teams and ensuring that the process was highly participatory. The process saw participation of the various council officials and leaders (area councilor, assistant Mayor) during the launch. This had a great implication notably the political will expressed in this process by the area political leadership. The settlement has experienced numerous disasters in the past with the most recent being a fire outbreak in July 2011, that blazed a section of Centre Base cluster affecting over 200 households. The haphazard structure layout was a factor leading to difficulties in putting off the blaze. The families affected have since reconstructed while others were totally unable to reconstruct. The MuST technical team had started negotiations with the community on the need for re-blocking and developing post disaster management strategies. With the federation having rooted itself in the settlement, igniting discussions on planning and upgrading can now be up scaled. The profiling of the settlement was conducted concurrently using three tools; enumerations, mapping and household sampling survey. With the nature of enumerations being at times a political process, the technical team ensured that the tool designed for the enumerations is simple and effective for uncomplicated data capture. This tool was shared with both the community and the municipal authorities where each party endorsed it for use in the enumeration. The process took place in three phases: mobilization of community, training of community teams and actual ground work. To set the process rolling, the Municipal council was in attendance during the launch of the actual activities. In an effort to capture detailed data vital for supporting planning, the university spearheaded a baseline household survey which ran parallel to the enumerations with none interfering with each other. The mapping was interlinked with enumeration, with the numbering process acting as the link between the two. Enumeration forms had a unique structure code that was mapped making it possible to link and associate this data after data entry. Mapping focused on detailed mapping of structures and the existing infrastructure. Various training sessions for both community enumerators and barefoot mapping teams were conducted in series. The training was held in 3 sessions, each comprising various clusters for effective trainings. Through the traditional empowerment of communities by SDI and affiliate NGOs such as MuST, the trainers comprised of technical team as well as seasoned federation members; community enumerators and organizers from other informal settlements in Kenya. 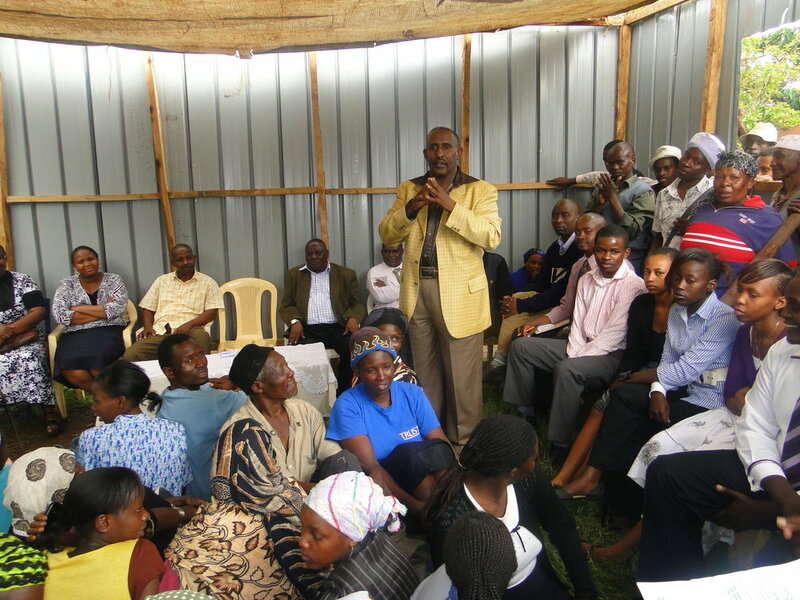 The community teams comprised various representation from key segments of the community; the federation, village heads (wazee wa vijiji), youth leaders, opinion leaders, women leaders and other non-federation members. After building the capacity of the community to collect its own data through trainings, the first activity for the project was rolled out. This was the numbering process which was unique to each of the ten clusters but with a common code segment for the settlement. The numbering process took a rapid two days to to complete. This set the stage for enumerations and mapping to follow. The mapping took a maximum of four days to complete. This was an exercise that was coordinated by the MuST technical team supported by research assistants from the university as well as federation members. With enumerations being dynamic, the enumerations team made sure that high ground coverage was achieved. One of the most challenging facets of enumeration is that of devising a strategy for taking into custody households that are almost unavailable during normal enumeration time. This was strategically resolved through various approaches. It is usually difficult to attain a hundred percent coverage of all households in an enumeration and for this usually a viable target is set. The un-enumerated households are later enumerated should the need for verification exercise succeed. The viable coverage target develops a viable data base that can be authenticated through a verification process. With ground enumeration have been conducted, the next key phase of this process is data processing that is projected to be finalized the soonest to pave way for follow up activities and engagements. The technical team is working on data entry for both spatial and the socio-economic data, that will eventually be linked to the mapping data in a GIS database for easy management. Part of the major planned activities is a joint planning studio. This studio is being organized by various partners: MuST & SDI and the African Association of Planning Schools (University of Nairobi being the local representative). The municipal is also anticipating the use of this data in aiding in the planning of the settlement. With the settlement having interest from various development outfits, this process is perceived as an avenue for initiating various development projects in the settlement. The aftermath of enumerations and mapping is the challenge of managing community expectations. Enumerations and mapping is no doubt a powerful tool for mobilizing communities. With the process having been endorsed by a key stakeholder, Municipal Council of Thika, it is probable that strategic engagements among all partners will yield to a development initiative that will positively impact on the physical and socio-economic character of the settlement. The deficiency in data on informal settlements has always been a contributing factor towards driving limited attention to informal settlements upgrading. 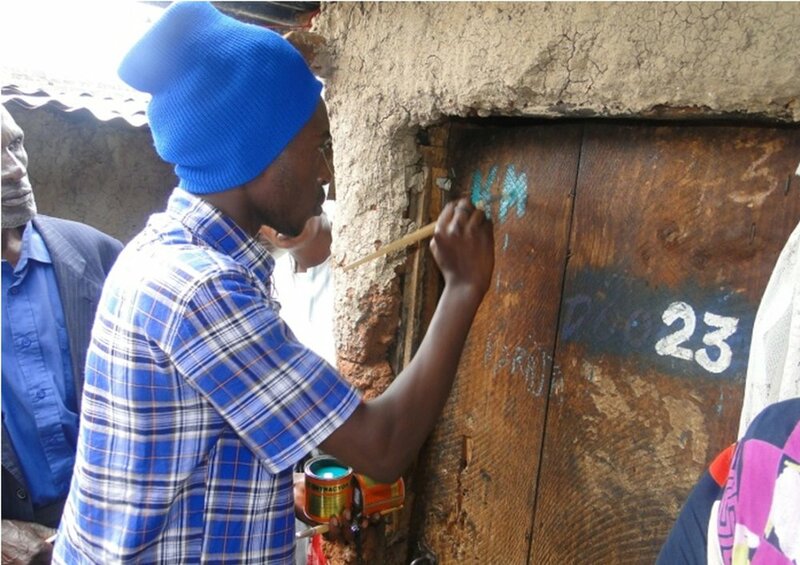 However the role of the slum federation (Muungano wa wanavijiji) with the facilitation of support organizations such as MuST in mobilizing poor urban communities to collect their own information has consistently led to the empowerment of informal settlement communities. This has been generating positive interest from various strategic quarters such as municipal authorities and utility service providers. MuST in collaboration with its partners is striving towards achieving improved well-being of Kiandutu residents in the coming future through various development initiatives. It’s certain that with the federation having set a firm ground in the settlement, the community is now better positioned to surmount its development inefficiencies.